By now, anyone who has been paying attention knows that Arctic sea ice is melting at an increasingly rapid rate opening up the possibility that the Arctic will be free of sea ice in summer by sometime in the next decade. But sea ice forms only one part of the Arctic equation. For a comprehensive view of the status of the Arctic one needs to look at a number of factors, which is just the Arctic Report Card does. On this year’s report card changes in three of the areas (atmosphere, sea ice, and Greenland) are attributed principally to global warming while changes in three others are considered to be the result of “mixed signals.” Last year only atmosphere and sea ice were attributed definitively to global warming. You can read the full report card here. From this page is it also possible to download a PDF of the report in which the charts and graphs, because they are larger, are easier to read. Below I have provided excerpts from each section just to give you a taste of the sort of information that the Arctic Report Card contains. If you are interested in learning more I would recommend reading the entire report. As you read through the excerpts that follow you may find this fine Arctic map useful. The year 2007 was the warmest on record for the Arctic, continuing a general, Arctic-wide warming trend that began in the mid-1960s (Fig. A1). Figure A1. Arctic-wide annual averaged surface air temperature anomalies (60°–90°N) based on land stations north of 60°N relative to the 1961–90 mean. From the CRUTEM 3v dataset, (available online at http://www.cru.uea.ac.uk/cru/data/temperature/. Note this curve does not include ship observations. 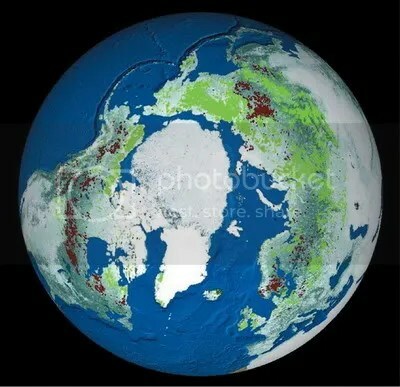 The Arctic sea ice cover is composed of perennial ice (the ice that survives year-round) and seasonal ice (the ice that melts during the summer). Consistent with the diminishing trends in the extent and thickness of the cover is a significant loss of the older, thicker perennial ice in the Arctic (Fig. S4). 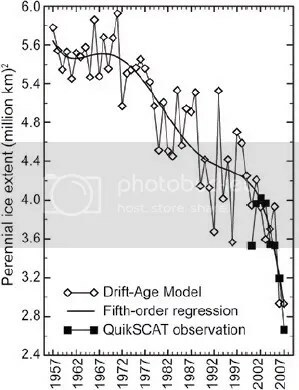 Data from the NASA QuikSCAT launched in 1999 (Nghiem et al., 2007) and a buoy-based Drift-Age Model (Rigor and Wallace, 2004) indicate that the amount of perennial ice in the March ice cover has decreased from approximately 5.5 to 3.0 million km2 over the period 1958–2007. While there is considerable interannual variability, an overall downward trend in the amount of perennial ice began in the early 1970s. This trend appears to coincide with a general increase in the Arctic-wide, annually averaged surface air temperature, which also begins around 1970 (see Fig. A1). In recent years, the rate of reduction in the amount of older, thicker perennial ice has been increasing, and now very little ice older than 5 yr remains (Maslanik et al. 2007). Many authors have recently acknowledged that a relatively younger, thinner ice cover is more susceptible to the effects of atmospheric and oceanic forcing (e.g. Gascard et al., 2008; Stroeve et al., 2008; Kwok, 2007; Ogi and Wallace, 2007; Maslanik et al., 2007; Serreze et al., 2007; Shimada et al., 2006). In the face of the predictions for continued warming temperatures (Christensen et al., 2007), the persistence of recent atmospheric (Comiso et al., 2008; Kwok, 2008) and oceanic circulation patterns (Steele et al. 2008; Polyakov et al. 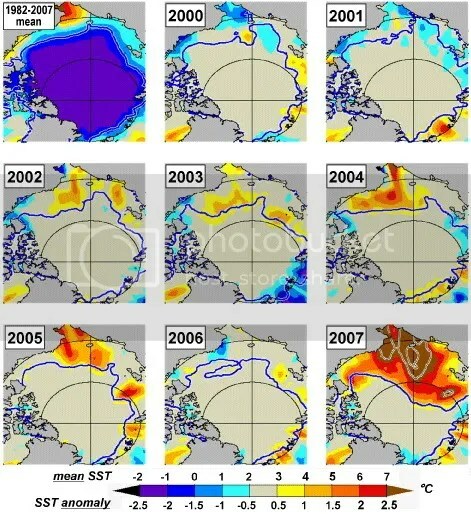 2007), and the amplification of these effects through the ice albedo feedback mechanism (Perovich et al., 2008), it is becoming increasingly likely that the Arctic will change from a perennially ice-covered to an ice-free ocean in the summer. Rangifer (wild reindeer and caribou) herds across the circumpolar north have long been characterized by periods of abundance and periods of scarcity. Recent population estimates indicate we may be entering a period of declining numbers. Populations that have been increasing at a steady rate since the early to mid 1970’s are either showing signs of peaking or beginning to decline. Figure R1 shows the current status of selected Rangifer (the major migratory herds and herds being monitoring as part of the CircumArctic Rangifer Monitoring and Assessment (CARMA) Network. Figure R1. Current status of the main migratory herds across the circumpolar north. In general, the Arctic Ocean continued to warm and freshen in 2007 under the influence of unusual atmospheric forcing and continued dramatic sea ice melt. These changes were accompanied by an unprecedented rate of sea level rise. Sea Surface Temperature (SST ) trends over the past 100 yr in the Arctic marginal seas (White, Kara, Laptev, East Siberian, Chukchi, and Beaufort) were analyzed by Steele et al. (2008). They found that many areas cooled up to ~0.5°C decade–1 during 1930–65 as the AO index generally fell (see Fig.A.5), while these areas warmed during 1965–95 as the AO index generally rose. 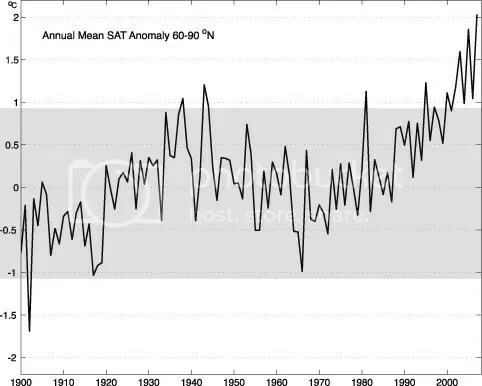 Warming is particularly pronounced since 1995, and especially since 2000 when the AO index exhibited relatively low and fluctuating values. Summer 2007 satellite-derived data indicate that SST anomalies were up to 5°C in ice-free regions (Fig.O2). Figure O2. (top left) Mean satellite-derived summer (Jul–Aug) SST (Reynolds et al. 2002) and anomalies from this mean over 2000–07. Latitudes 70° and 80°N and longitudes 0°/180° and 90°E/270°E are shown. For 2007, extra contours for 3° and 4°C are provided. Also shown is the Sep mean ice edge (blue contour) for each year (from Steele et al. 2008). The terminus of Greenland’s largest glacier, the Jakobshavn’s Isbrae near the town of Ilulissat, retreated 0 to 500 m in 2007 (Fig. G3), continuing a retreat that began summer 2001 with a dramatic 11-km floating ice collapse (Weidick and Bennike 2007). The large ice lagoon called Tissarissoq at the south side of the fjord was flushed of ice by the end of the summer, ice-free probably for the first time since at least the onset of the Little Ice Age (ca. 0.4–0.1 ky BP). It is possible that Tissarissoq was ice-free before that time during the medieval warm period (ca. 1.1–0.5 ky BP). Figure G3. 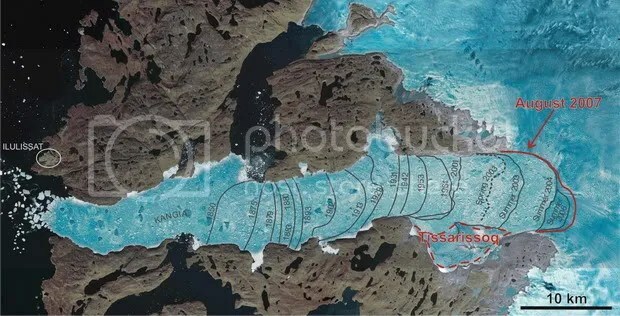 Front position of the Ilulissat (Jakobshavn Isbrae) glacier in 2007 and earlier years, based on Weidick and Bennike (2007). The image mosaic is from Jun 2003 Landsat and ASTER images. (click for larger image). Evidence of widespread changes in vegetation in northern latitudes comes from trends in terrestrial greenness as detected by the Normalized Difference Vegetation Index (NDVI) derived from the NOAA AVHRR satellites (Myneni et al. 1997; Zhou et al. 2001; Lucht et al. 2002; Jia et al. 2003; Goetz et al. 2005; Bunn et al. 2007). During the 1981–2005 period of observation, about 6% of the circumpolar tundra area experienced an increase in NDVI and about 1% experienced a decrease (Fig.L1; Bunn et al. 2007). The positive trends in NDVI in tundra areas have been strongest in North America. For example, in the tundra region south of 70°N (the region of the Arctic with a consistent AVHRR record from 1982 to 2005) the rate of change in NDVI is +0.58% yr–1 over the North American Arctic compared to +0.34% yr–1 over the Eurasian Arctic (Jia et al. 2007). Forested areas experienced a slight decline over the same period: NDVI declined in 6% of the forested area versus an increase in 4% of the area. Vegetation responds relatively quickly to warming temperatures by growing more vigorously and densely. Over a longer time span, changing climate alters vegetation type. Land cover on much of the Alaska North Slope, for example, is transitioning from tundra to shrubs (Wang and Overland 2004). Recent vegetation dynamics observations across the Arctic also indicate that, in general, shrubs have become more abundant and taller. A study in northern Alaska (Tape et al. 2006) showed that both larger and smaller shrub species have increased in size, abundance and extent over the last 50 years. As well as increasing in size and filling in empty patches, the shrubs were colonizing new areas (Figure L2). Figure L2. Large shrubs have colonized a river terrace that was virtually free of large shrubs in 1949. The new shrubs are more than 2 m high. In the foreground are poplar trees. Photo from the Chandler River located at 68° 25.14′ N, 161° 15.24′ W: 7/4/1948 and 7/29/2001. (Tape et al. 2006). I realize that an article like this, posted only one day before the most important presidential election in the last 75 years (actually the subject of this article: Climaticide is the biggest reason that this is the most important presidential election in 75 years) may draw only minimal attention. That is perfectly understandable. But it is also strikes me as perfectly clear that on the day after that election, information such as this need to be in the foreground of everyone’s thoughts. And those thoughts must spur us to action if we are to avoid the Climaticide that threatens us, our children, our grandchildren and untold generations to come with unimaginable, and for the most part, unnecessary, misery and suffering.